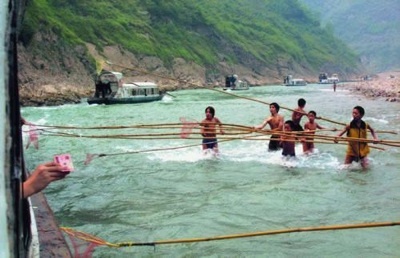 I thought these very long pole nets, invented by these kids in China, are an ingenious solution to a problem of many kids in the developing world: need some money. Their particular problem was that scores of tourists float by in boats going down a scenic river, but they don’t get quite close enough to beg money from. Some tourists would be willing to donate if they could get some money to the boys. The solution is to lash a fishing net to a long bamboo pole which can reach the boats are certain turns. The boys reach their poles out and the tourist deposit the bills. The one in the picture is dropping a red 100 renbi note which is worth about US$8. That’s a big tip for these guys. But the solution is so clever I’d almost be willing to give them something for their effort. The photographer and source for this picture is unknown; I found it at this site of China photos. I saw a similar thing at Cartagena, Columbia. The La Popa monastery is up on a hill, and the kids climb up as high as they can, then poke their poles up to beg. They used cut off pop bottles instead of a net though. I’ve seen the same thing on the Mexican border near McAllen, TX. People can’t reach the bridge and foreigners cross, so they have long poles with jugs attached. This is counter to the old way: throwing money and watching people run for it.